Cuckoo for Coconuts: JAM ON IT! Over the last few weeks I have been trying my hand at making jams. All have come out really good. Only one was a little thin, so I hade to "re-make" it as they say in the jam world. 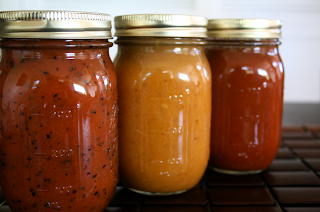 Re-making is when you open the jars after 24 hours and re-cook with a little more pectin. It is best to do this process 1 jar at a time. Pictured above from left to right are Passionfruit, Banana & Banana/Papaya. I thought I had died and gone to heaven when I first tasted the banana, but he passionfruit is to die for. I can honestly say that the Banana Jam is pure gold in a Ball canning jar. I love it! I'll eat it again and again! Ooops - the comment I left yesterday went missing? I've tasted your banana jam - it's amazing! More so that someone thinks to make jam from bananas - this is the first I'd heard of it. I'll trade you a passionfruit for one on my mommas's crazy bright orange peach/pineapple preserves?! omg! i loooooove your momma's bright orange peach/pineapple preserves. there is a similar one in the stores here, apricot/pineapple. kind of close but not as juicy.